The opening team of La Vista 101. On the far left is executive chef JD Woodward and on his right is owner Greg Gordon. Jeb Stuart is on Gordon's right. Photo courtesy of La Vista 101. Southern Goods fans were happy to hear that executive chef J.D. Woodward landed a position at Greg Gordon’s new restaurant, La Vista 101 at 1805 West 18th Street in Houston’s Timbergrove neighborhood. Southern Goods was shuttered by a fire and it was just announced that it is not reopening. After a mere two months in business though, Woodward has already left and the restaurant has also parted way with general manager and sommelier Jeb Stuart. 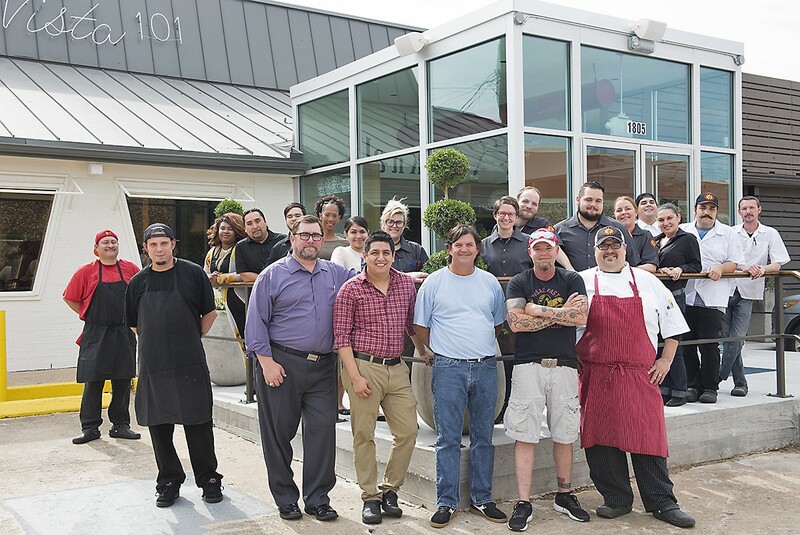 The restaurant at 1805 West 18th Street in the Heights was relocated in May of last year from Briargrove after 20 years in operation. The new space offered a more customizable 3,000-square-foot operation with room outdoors for a patio. Owner Greg Gordon wanted to maintain the Italian roots of La Vista and chose Woodward for a younger approach to the cuisine. Stuart, formerly of Coltivare, was brought on not only as general manager but also to lead the curation of an extensive European wine list. Woodward’s experience garnered at Underbelly, Rainbow Lodge and Southern Goods inspired a menu that utilizes pickling, large meat dishes and locally-grown produce. The current menu includes small plates of familiar dishes like grilled octopus, beef carpaccio, and hummus; a section of pizzas and pastas that includes vegetarian options; plus larger plates like fresh grilled or whole fried fish. Ate there recently, disappointing, to say the least. Not sure if the chef, the GM, or the owner (all three?) are to blame, but this seems one more example of the self-importance of Houston food people. Ho-hum news, the restaurant should probably close, and Jeb Stuart can wash the taste out of his mouth on the Redneck Riviera.